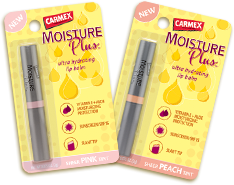 As a new member of the Carmex Blog Squad, I recently received a set of Carmex Moisture Plus Sheer Pink and Sheer Peach Tint Lip Balms to try for my self. I was also given a 2nd set to giveaway to you my readers! I was a little nervous when I opened the top of these and saw the bright lip balm in the tube, but I was pleasantly surprised when I applied the lip balm and it showed a subtle hit of tint. Just what I like in a lip balm. Noticeable yet not overwhelming, which is exactly what these tints are. I like the combination of SPF 15 for year round protection added with the tint for work or a night on the town. The lip balm went on very smoothly and felt great on my lips for hours after I applied it! With a little help from vitamin E and aloe, Carmex Moisture Plus™ lip balm helps nourish and moisturize lips leaving them so kissably soft they will be hard to resist. With SPF 15, Carmex Moisture Plus protects your lips from the sun so you can play all day and know you’re covered. Take it out for a night on the town. A sheer pink, sheer peach or clear satin gloss finish add a hint of shine, while the sleek, slant-tip applicator looks almost as stylish as you. *Tints are only available at Walgreens and Walgreens.com. They retail for $2.99 each. Thanks to Carmex, one lucky winner will receive 1 Sheer Pink Tint and 1 Sheer Peach Tint Carmex Moisture Plus Tints, just like what I received! This giveaway will end December 3rd at 9:00 PM EST. The winner will have 48 hours to respond to my email. If no response, a new winner will be chosen. CLOSED - Congratulations star84vu you have 48hrs to respond to my email before a new winner is choosen. Tell me why you want to win these lip balms. Disclosure: Carmex provided me with a set of Carmex Moisture Plus Sheer Pink and Sheer Peach Tint Lip Balms for the purpose of my personal review. This blog post is not a paid post and the opinions stated are my own. I love the little Carmex in the tins and have never tried any of their other products. I'd love to try these Sheer Tints. I would like to win because I have always loved their original lip care and so I expect this will be awesome as well! I love carmex and have never tried anything but their tub of lip balm! I'd love to try these - my lips are always dry in the winter. I would like these because I always have to have something on my lips, especially chapstick! I'd like to win because I like using 2 in 1 lip products and I think these would have the perfect amount of moisture and color. I follow Carmex on twitter @Aerated. I really need a better lip balm now that I'm pregnant and my lips are super dry! I love Carmex and would love to try their new products. I entered your Robi Comb giveaway. I want to win because my lips get so dry in this cold winter air! I want to win these lip balms because my lips need extra moisture in the wintertime! I want to win because I've only used the Carmex original jar. Would love to try these! I have always used the plain Carmex and I would like to try the moisure plus with tints. This article was extremely interesting, especially since I was searching for thoughts on this subject last Thursday..